US Customs and Border Protection (CBP) is at a “breaking point” as it faces an “unprecedented humanitarian and border security crisis,” Brian Hastings, CBP’s chief of law enforcement operations, said recently. In February the agency apprehended 76,000 people at the southern border, including 36,000 traveling with family members—the highest number in 12 years. CBP expects to make 150,000 arrests at the southern border in April. CBP says its existing facilities weren’t built to accommodate this many people. Detention centers in the El Paso area are reportedly at operating at triple or even quadruple their maximum capacity, and the agency was pilloried for temporarily housing thousands of migrants, including children, in a holding pen underneath a bridge in near-freezing temperatures. The detainees were later moved to indoor facilities at local shelters and a nearby US Border Patrol station. 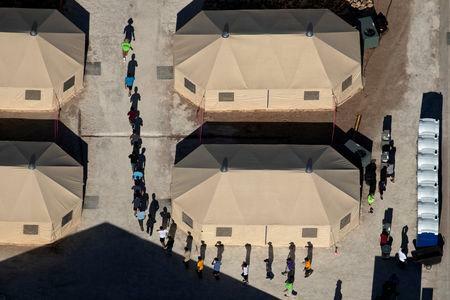 CBP is now expanding its capacity to take custody of even more people, spending as much as $37 million over the next eight months to build two new tent cities for children and families detained in Texas, according to a newly-issued federal contracting notice reviewed by Quartz. The work order says the “temporary (8 months) soft-sided facilities” will be located in Donna, TX and El Paso, TX and are meant to give CBP “additional capacity to accommodate family units and UAC [unaccompanied children] arriving in surging numbers to the southwest border,” housing up to 500 people at each location. CBP says kitchen equipment, shower trailers, laundry trailers, chemical toilets with sinks, and shipping containers for “detainee property storage” will be provided. The contract also includes office space for border enforcement officials, surveillance cameras both inside and outside the facility, security guards, electricity, HVAC services, and gun lockers. The 2016 Donna tent city cost just $3.8 million, per immigration officials cited at the time by the San Antonio Express-News. CBP officials were not immediately available for comment; this post will be updated if/when they respond. Read the full text of the new CBP contracting document here. They just closed the largest tent shelter for unaccompanied minors in January and released them all into the U.S.
Trump didn't deport any of them. EL PASO, Texas (Reuters) - The U.S. government has moved out all the migrant teens who were living in a tent city in the Texas desert and is set to close it down, according to the organization running the facility, after the shelter became a controversial symbol of President Donald Trump's crackdown on illegal immigration. BCFS, a San Antonio-based nonprofit running the temporary shelter for the U.S. government, said on Friday that "there are no more children in Tornillo," but did not say if they had all been released to sponsors or had been moved to other facilities. The U.S. Department of Health and Human Services (HHS) had said there were more than 850 migrants being held there as recently as Jan. 6 but did not immediately respond to a request for comment on the releases. The shelter opened on June 14 to handle the ballooning number of unaccompanied children being kept in detention. Immigration advocates raised concerns about how long minors were being held in the makeshift tents and some protesters had set up camp near the facility. At its peak in December the sprawling field of beige colored tents housed 2,800 teenagers, mostly from Central America, who crossed the border alone. Trump has called the increasing number of children and families crossing into the United States a humanitarian crisis. This and his assertion that immigrants and drugs are streaming across the southern border have fueled his demand for a border wall, despite statistics that show illegal crossings are at a 20-year low and that many drug shipments are likely are smuggled through legal ports of entry. On Thursday Trump traveled to Texas to press his case for the wall, even as the government remained partly shut down in a dispute with Democrats over funding for it. The government is legally limited in how long it can detain immigrant minors who cross the border but a policy to increase vetting of potential sponsors has lead to long delays in processing their cases, leaving some children languishing in government care for months. "Our goal is to close Tornillo as quickly but as safely as possible," Victoria Palmer, an HHS spokeswoman, said earlier this week. Protesters who have been monitoring the camp said they have seen a steady outflow of infrastructure like tents. BCFS confirmed to Reuters it was working to demobilize the facility and removing shelter trailers and tents as more children leave Tornillo. "This tent city should never have stood in the first place but it is welcome news that it will be gone," tweeted Will Hurd, a Republican U.S. congressman from Texas. The statute allows the President to suspend the entry of any aliens or of a class of aliens or place restrictions on the entry of a class of aliens temporarily if he or she determines that the entry of such aliens would bedetrimental to the U.S. interest. Get it on FB, on Twitter, on email...on everything you got! Call Trump on the carpet to declare this Proclamation and stop this invasion now! Yes, it is their Pretend to end Catch and Release scheme. There are also 1 million denied asylum claims who are still running around footloose and fancy free. Nation Apr 16, 2019 5:56 PM EDT HOUSTON — The Trump administration wants to open two new tent facilities to temporarily detain up to 1,000 parents and children near the southern border, as advocates sharply criticize the conditions inside the tents already used to hold migrants. What happened to "I will NOT warehouse thousands of illegal aliens on our border"? Another promise broken and not kept! What about our homeless families, Veteran's, and Seniors? Where is their $37 MILLION dollar facility! This is outrages! Send them back! SPEND THE MONEY ON BUS TICKETS BACK HOME! WE DO NOT WANT THEM! OUR TAXPAYER DOLLARS ALREADY PAID TO BUILD STADIUMS ALL OVER THIS COUNTRY! WE HAVE SCHOOL BUSES OUR MONEY PAID FOR...USE THEM TO BUS THEM TO THE DOCK ON AWAITING BARGES! THE STADIUMS HAVE BATHROOMS, SHOWERS, KITCHEN FACILITIES AND LARGE PARKING LOTS FOR OUR MILITARY TO SECURE THE PERIMETER! LET THE MILITARY SET UP A HEATHCARE TENT...ALL SICK ONES, UAC'S AND PREGNANT ONES GET FAST TRACKED BACK HOME! PUT JUDGES ON 3 SHIFTS, 24/7 AND DEPORT THEM OUT OF HERE! NOT ONE MORE DAMN DIME OF OUR MONEY FOR "HEADS ON BEDS"...WE WANT "BUTTS ON BUSES BACK HOME"! Section 212(f)of the Immigration and Nationality Act (INA) gives the President of the UnitedStates broad authority to implement immigration restrictions by proclamation.The statute allows the President to suspend the entry of any aliens or of a classof aliens or place restrictions on the entry of a class of aliens temporarilyif he or she determines that the entry of such aliens would be detrimental tothe U.S. interest.